Before continue into further lets discuss two things. How doesXshippingpro calculate Per Unit Cost? If you noticed, I have entered Per Unit Block is 1 for the second unit row. Since cost is defined $2 to that row. So each block cost would be $2. Lets calculate how may blocks out there. How does Xshippingpro calculate Additional Price? If xshippingpro find a match among the unit ranges, it will not move forward to Additional Price. But if there no proper matching is found, xshippingpro will move ahead to Additional Price rule and try to calculate shipping cost depending on its value. 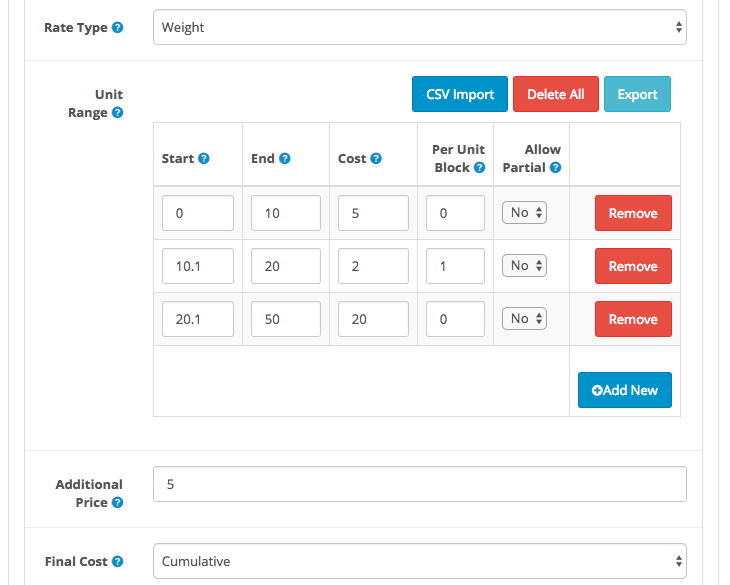 By default, xshippingpro calculate additional cost per 1 Unit e.g 1 KG in this case (or whatever Rate Type you defined. If you define Rate type is Quantity, then Per 1 Item) basis unless you define Per Unit Block in the last unit row. Let’s proceed to main discussion. Lets say we have cart weight 60KG so what would the final shipping cost according to above setting? This entry was posted in Trick & Tips, Xshippingpro and tagged xshippingpro on September 6, 2018 by samir.